We conducted a systematic review and meta-analysis to compare the accuracy of the QuantiFERON-TB® Gold In-Tube (QFT-G-IT) and the T-SPOT®.TB assays with the tuberculin skin test (TST) for the diagnosis of latent Mycobacterium tuberculosis infection (LTBI). The Medline, Embase and Cochrane databases were explored for relevant articles in November 2009. Specificities, and negative (NPV) and positive (PPV) predictive values of interferon-γ release assays (IGRAs) and the TST, and the exposure gradient influences on test results among bacille Calmette–Guérin (BCG) vaccinees were evaluated. Specificity of IGRAs varied 98–100%. In immunocompetent adults, NPV for progression to tuberculosis within 2 yrs were 97.8% for T-SPOT®.TB and 99.8% for QFT-G-IT. When test performance of an immunodiagnostic test was not restricted to prior positivity of another test, progression rates to tuberculosis among IGRA-positive individuals followed for 19–24 months varied 8–15%, exceeding those reported for the TST (2–3%). In multivariate analyses, the odd ratios for TST positivity following BCG vaccination varied 3–25, whereas IGRA results remained uninfluenced and IGRA positivity was clearly associated with exposure to contagious tuberculosis cases. IGRAs may have a relative advantage over the TST in detecting LTBI and allow the exclusion of M. tuberculosis infection with higher reliability. Improvement of diagnostic methods for latent Mycobacterium tuberculosis infection (LTBI) is an important step towards the goal of tuberculosis elimination, as laid out by the WHO Stop TB strategy 1 and The European Centre for Disease Prevention and Control (ECDC) Framework Action Plan to Fight TB in the European Union 2. As part of reaching this goal, individuals infected with M. tuberculosis need to be identified and offered preventive therapy to stop the progression to active tuberculosis and prevent further M. tuberculosis transmission 3. Thus, there is a need to develop more accurate methods for the detection of LTBI, and to provide evidence-based guidance on the use of such methods before they can be adopted by national tuberculosis screening programmes 4, 5. In most areas of Europe, the identification of LTBI relies on the tuberculin skin test (TST). This diagnostic test has been assessed comprehensively in terms of its potential and limitations for use in preventive strategies for tuberculosis elimination 6. However, the TST does not discriminate between potential infection with M. tuberculosis and prior vaccination with the bacille Calmette–Guérin (BCG), or possible infection with nontuberculous mycobacteria (NTM). Interferon (IFN)-γ release assays (IGRAs) are in vitro immune tests that have been introduced in recent years as an alternative to the TST for the diagnosis of LTBI. IGRAs are based on the detection of a T-cell immune response towards M. tuberculosis complex specific antigens (early secretory antigenic target (ESAT)-6, culture filtrate protein (CFP)-10 and/or TB7.7). To date, there are two commercially available platforms that measure IFN-γ production following ex vivo antigen stimulation 7: in the QuantiFERON®-TB Gold In-Tube test (QFT-G-IT) and its predecessor the QuantiFERON®-TB Gold (QFT-G) test (Cellestis Ltd, Carnegie, Australia), the amount of IFN-γ released into the supernatant is quantified using an ELISA 8, whereas the proportion of blood cells releasing IFN-γ is determined with the T-SPOT®.TB assay (Oxford Immunotec Ltd, Abingdon, UK) using an enzyme-linked immunospot (ELISPOT) technique 9. As the antigens used in IGRAs are almost exclusively expressed by the M. tuberculosis complex, with the exception of Mycobacterium kansasii, Mycobacterium szulgai, Mycobacterium marinum and Mycobacterium riyadhense, IGRAs are less likely to be confounded by prior BCG vaccination and/or exposure to NTM 10. For any new test to replace the TST, evidence of the test’s higher diagnostic accuracy is needed. Importantly, such a test should show a higher specificity (ability to exclude M. tuberculosis infection), especially in subjects with confounding factors, such as BCG vaccination, and at least a similar sensitivity. However, the lack of a gold standard for diagnosing LTBI is a problem when trying to determine the diagnostic accuracy of both the IGRAs and the TST 11. An alternative way to evaluate sensitivity, which cannot be assessed directly in this context, is through comparison of the risk of developing active tuberculosis in subjects with an increased risk of progression from LTBI to active disease. The adoption and implementation of IGRAs into national tuberculosis screening programmes should be evidence-based. Several countries have, to date, adopted IGRAs for the diagnosis of LTBI within tuberculosis screening programmes and guidance documents on their use are available 4, 12, 13. Clinical guidance for the diagnosis of LTBI is especially important for the care of immunocompromised individuals, e.g. patients undergoing tumour necrosis factor (TNF)-antagonists therapies 14, who carry an increased risk of progression to active tuberculosis. Several studies, and consequent systematic reviews and meta-analyses have been conducted evaluating IGRA accuracy in diagnosing LTBI 15–18. Furthermore, evidence on the actual predictive value of the IGRAs (i.e. the relationship between having a positive or negative IGRA result and developing or not developing tuberculosis) is emerging 19–22. To further support public health programmes, a continuous assessment of the use of IGRA for the diagnosis of LTBI is, therefore, needed. This article provides important up-to-date information on the use of IGRAs to support the development of evidence-based guidance for tuberculosis screening programmes. These data may also be helpful for conducting more reliable cost-effectiveness and cost–benefit analyses with respect to the use of IGRA or TST, solely or in combination. Specifically, the diagnostic specificity of IGRAs relative to the TST, the IGRAs’ negative (NPV) and positive (PPV) predictive values for the progression to active tuberculosis, the association between exposure to patients with tuberculosis, and IGRA and TST test results in contacts were evaluated. We present a systematic review and meta-analysis of the literature according to evidence-based highest-standard criteria on the accuracy of commercially available IGRAs for the diagnosis of LTBI. We conducted this systematic review according to the guidelines of the Preferred Reporting Items for Systematic Reviews and Meta-Analyses statement 23 and the Quality Assessment of Diagnostic Accuracy Studies (QUADAS) checklist 24. We searched Medline, Embase and the Cochrane Central Register of Controlled Trials (CENTRAL; Cochrane Library 2009, issue 3) through November 15, 2009 for studies published in English. The following search terms were used: “Tuberculosis” OR “TB infection” OR “TB disease” AND “QuantiFERON” OR “Elispot” OR “T-SPOT” OR “interferon-gamma assay” OR “interferon-γ release assay” OR “T cell assay” AND “ESAT-6” OR “CFP-10”, were separately combined with the terms “NPV” OR “negative predictive value” OR “negative PV”, “PPV” OR “positive predictive value” OR “predictive” and “TST” AND “BCG”. No restrictions were made with respect to basic study design or data collection (prospective or retrospective). Secondary references cited by the studies and review articles retrieved from the databases were reviewed. Unpublished sources of data were not included in this systematic review. From studies identified as potentially relevant, original articles or letters to the editor were chosen that met the following criteria: original data were presented; the most recent commercially available IGRAs (QFT-G-IT and T-SPOT®.TB) were used with European cut-offs for positive test results (in US Food and Drug Administration-approved criteria, a person is T-SPOT®.TB negative if they have four or fewer spots above the nil control, positive if they have eight or more spots above the nil control, and borderline (or equivocal) if they have five to seven spots above the nil control); active disease in participants was confirmed by culture, nucleic acid amplification technique and/or histopathological examination; and, if comparing results of two or more tests, these had to be performed in the same individuals. The following studies were excluded: case reports, editorials, immunological (laboratory) and animal studies; studies not following the manufacturers’ instructions, e.g. in vitro incubation >24 h or freezing of cells; studies involving patients whose diagnosis of active tuberculosis relied solely on clinical evaluation or radiological features, improvement of symptoms while on anti-tuberculosis therapy, and/or on smear positivity; and mixed studies, in which the number of unconfirmed and confirmed patients was not presented separately, thus possibly resulting in a selection bias. Three reviewers performed the review of titles and/or abstracts and 53 publications were retrieved for full text review (fig. 1). Flow diagram for study selection. NPV: negative predictive value; PPV: positive predictive value; TST: tuberculin skin test; IGRA: interferon-γ release assay; TB: tuberculosis. #: seven studies also belonging to another category. Both study selection and data extraction were conducted independently, in duplicate, by the authors of the present study, in order to reduce the risk of errors. A data extraction form was created, including a subset of predefined items covering inclusion and exclusion criteria, as described above. These criteria included: study setting (country); year(s) of performance; type of patient and method used to recruit participants (including number of eligible and subjects); study duration (from/to); and loss of participants during the observation period follow-up. For analysis of specificity, NPV, NPV for progression and PPV for progression (see section on “Data synthesis and analysis” for definitions), the following study contents were documented: IGRA(s) used; mean age or age composition; number of participants finally included; number of subjects for whom valid test results were available (after subtraction of indeterminate, i.e. uninterpretable results); duration of follow-up; number of test results considered true negative and false positive in persons at very low risk of M. tuberculosis infection (specificity); number of confirmed tuberculosis cases with negative IGRA scores (i.e. 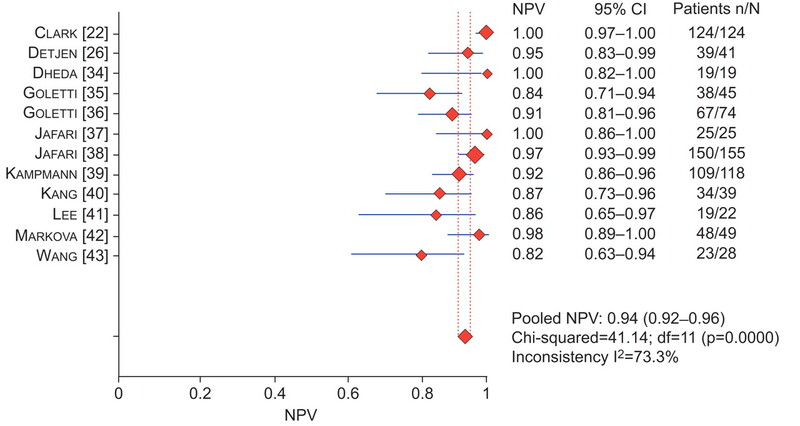 number of false negatives in active tuberculosis patients to measure NPV); number of confirmed nontuberculosis cases with negative IGRA scores (i.e. number true negatives in suspects of active tuberculosis to measure NPV); number of score-negative test results among persons at risk and screened for LTBI who later developed active disease (i.e. false negatives for NPV for progression); number of score-negative persons screened for LTBI that did not develop active tuberculosis (true negative for NPV for progression calculation); untreated scored-positive persons who developed active tuberculosis during follow-up (PPV for progression); and, lastly, number of scored-positive persons screened for LTBI with a confirmed relationship to their index case, as demonstrated by highly discriminating molecular genotyping. For analysis of the correlation between TST and IGRA results, and infection-exposure among BCG-vaccinated or -unvaccinated subjects, the following items were also included (or recalculated, if possible, from the available data): time of BCG vaccination; assessment of BCG vaccination among the study participants; TST units; type and chosen cut-off (induration diameter); number of participants finally tested by TST and at least one IGRA; assay used; number of subjects for whom test results were available; TST and IGRA results (if available, also in BCG-vaccinated or -unvaccinated subgroups); number of indeterminate results (if any); results on IGRAs/IGRA/TST concordance and discordance; statistical agreement (κ statistics) in total and subgroups; and, lastly, odd ratios of independent predictors for IGRA and TST positivity. In the case of TST performance, results using the cut-off chosen by the authors, as part of the respective study design, were taken for our review. Additional clarifications on studies were requested by personal correspondence with the authors. Any discrepancies were resolved by consensus with the help of the team coordinator and, thus, obtaining an inter-reviewer agreement of 100%. The following definitions of specificity, NPV, NPV for progression and PPV for progression were used for analysis. The specificity was defined as the number of true negatives divided by the sum of true negatives and false positives. As there is no gold standard to ascertain LTBI in a study subject, specificity studies are typically conducted in low-prevalence countries and settings in which the population is at no risk, and there is no suspicion or evidence of LTBI or prior tuberculosis (any individual with a positive test score being considered false-positive). Specificity is, therefore, the measure of a test’s ability to score LTBI-free, healthy subjects as test-negative. This definition holds for both IGRAs and the TST, irrespective of BCG vaccination status. Generally, the NPV of a screening test is defined as the number of true negative test results divided by the sum of true and false negative results, all in individuals suspected to have a disease. With regards to diagnosing active tuberculosis, this refers to the degree to which a test does not score a person with active tuberculosis as test-negative, i.e. the certainty that a score-negative person does not have active tuberculosis. Translating this definition to persons suspected of LTBI, the NPV measures the degree to which a test does not score a person infected with M. tuberculosis as score-negative, i.e. the certainty that a score-negative person does not have LTBI. Again, due to the lack of a gold standard for LTBI identification, studies commonly determine the NPV among patients with confirmed active tuberculosis, using the proportion of patients with false-negative test scores as a surrogate for the proportion of false-negative scores in LTBI suspects. The number of true negative cases is consequently the number of individuals, suspected of active tuberculosis that are subsequently confirmed not to have active disease. NPV for progression is defined as the proportion of IGRA score-negative subjects that do not progress to active tuberculosis in a longitudinal, follow-up study of individuals tested for LTBI. Subsequently, this value reflects a test’s ability to correctly predict that an LTBI score-negative individual will not develop active tuberculosis in later life, provided they have no further exposure to infection. As only subjects infected with M. tuberculosis can develop disease, the NPV can be measured by following subjects that scored negative for LTBI over time, and quantifying the number that have remained free from active disease. The PPV for progression is defined as the proportion of IGRA score-positive subjects that develop active tuberculosis in a longitudinal, follow-up study of individuals tested for LTBI. Subsequently, this value reflects a test’s ability to correctly predict that an LTBI score-positive individual is at risk of developing active tuberculosis in later life. As for NPV progression studies, this value is measured by following subjects that scored positive for LTBI over time, and quantifying the number that did develop active disease. Estimates of specificity, NPV and PPV, and their respective 95% confidence intervals were calculated for each of the included studies and used, if applicable, to calculate pooled estimates. Pooled estimates are weighted averages built by using the study sample sizes as implicit weights. Weighted pooled estimates were compared by the Pearson’s Chi-squared test (or Fisher’s exact test, when the expected cell sizes were smaller than five). All p-values reported are based on two-tailed comparisons with the statistical significance set at p<0.05. Statistical heterogeneity between studies was assessed using the inconsistency (I2) statistic described by Higgins et al. 18. The test describes the percentage of total variability within a set of effect sizes that is caused by true heterogeneity rather than by sampling error (chance). I2 = 100%×(Q−df)/Q, where Q is the Chi-squared statistic and df enumerates the degrees of freedom. If applicable, forest plots were built to investigate whether outcomes were stable over a series of studies. Statistical analyses were performed using Meta-DiSc software, version 1.4 25, and by applying SPSS version 18.0 for Windows (SPSS Inc., Chicago, IL, USA). The study selection process is shown in figure 1. 432 citations were identified, of which 60 articles were eligible for final inclusion for one or more of the following topics: specificity, NPV in patients with active tuberculosis, NPV for progression, PPV for progression, and association of IGRAs and the TST with M. tuberculosis exposure and BCG vaccination. Overall, the quality, evaluated by the QUADAS tool, was very high and 11 (91.7%) out of 12 study quality indicators were met by 100% of the included studies, thereby increasing the strength of scientific evidence of the review. Only four published studies evaluated the QFT-G-IT and/or T-SPOT®.TB specificity in a total of 346 subjects with valid IGRA results 26–29, fulfilling the inclusion criteria. The specificity of the IGRAs ranged from 98% (95% CI 86.8–99.9%) 26 for the T-SPOT®.TB to 100% (95% CI 97.6–100%) 29 for the QFT-G-IT, for which specificity estimates were available in all four studies of 99.4% (95% CI 97.9–99.9%) (table 1). We excluded studies from analysis that either used criteria from the USA for scoring T-SPOT®.TB results 30, or that were performed in intermediate tuberculosis burden countries. In the latter, even individuals belonging to low-risk groups may have been exposed to unknown M. tuberculosis infection with a potentially higher risk of infection than that expected in low-burden countries 31–33. Regarding the comparison of IGRAs with TST, one report 28 was excluded because the TST was not performed in all the enrolled subjects. From the data that could be analysed, TST specificity ranged from 55% (95% CI 38.5–70.7) 26 to 95% (95% CI 87.7–97.2%) 29, with a pooled specificity of 88.7% (95% CI 84.6–92.0). When comparing the IGRAs and TST results, only a few subjects not exposed to M. tuberculosis scored positive by IGRAs compared to TST, particularly individuals with known prior BCG vaccination or confirmed NTM infection (table 1). 18 articles satisfied our inclusion criteria for evaluating the NPV; 13 assessed the NPV among confirmed tuberculosis cases 22, 26, 34–44 and six assessed the prospective outcome in IGRA-negative individuals after an average of 2 yrs 19–22, 45, 46. Among the studies in which the NPV was evaluated in patients with confirmed tuberculosis (387 tuberculosis cases with a valid T-SPOT®.TB result and 304 with valid QFT-G-IT result), the NPV varied greatly, irrespective of the IGRA used. Among the 13 articles, the NPV ranged between 74.4% 36 and 100% 22, 34, with a pooled value of 94% (95% CI 92.1–95.6%) for the T-SPOT®.TB and 88% (95% CI 84.6–91.5%) for the QFT-G-IT (figs 2 and 3). Negative predictive value (NPV) of T-SPOT®.TB assay in tuberculosis suspects. df: degrees of freedom. Negative predictive value (NPV) of QuantiFERON®-TB Gold In-Tube assay in tuberculosis suspects. df: degrees of freedom. In the six longitudinal studies assessing the NPV among healthy persons, a total of 1,442 individuals scored negative by the QFT-G-IT and 182 scored negative by the T-SPOT®.TB (figs 4 and 5) 19–22, 45, 46. Negative predictive value (NPV) for progression in QuantiFERON®-TB Gold In-Tube assay negative subjects. df: degrees of freedom. Negative predictive value (NPV) for progression in T-SPOT®.TB negative subjects. df: degrees of freedom. 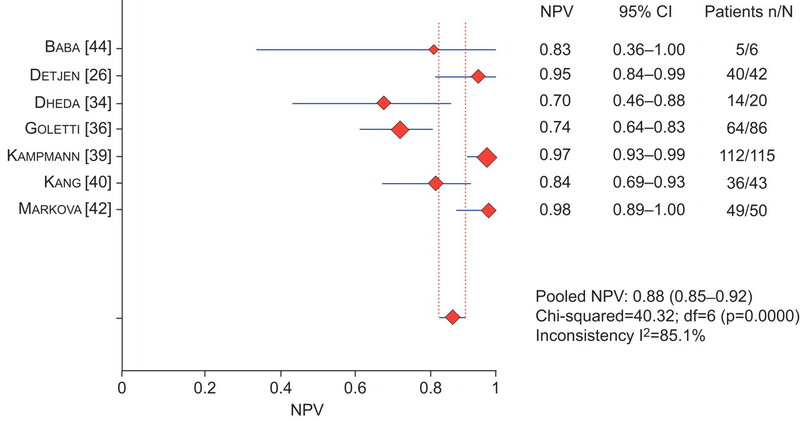 Although subjects at increased risk for developing tuberculosis were included in all studies, the pooled NPV for progression was high in the five studies performed in low-incidence countries. For these five studies, the pooled NPV for the QFT-G-IT was 99.8% (95% CI 99.4–100%; three individuals contracted tuberculosis among the 1,442 scored-negatives) and 97.8% (95% CI 94.5–99.4%) for the T-SPOT®.TB (four individuals contracted active tuberculosis among the 182 scored-negatives). Conversely, the NPV of the included study performed in Thailand 46, an intermediate-burden country, was 88% (95% CI 63.6–98.5%). In the majority of the evaluated studies, it was not possible to compare the NPV estimates for IGRAs to that of the TST results 19, 21, 22, 45, 46. In particular, in two studies performed on HIV-infected persons, TST-negative individuals were excluded from the follow-up 19, 22. Only one study performed a comprehensive follow-up that included TST and IGRA scored-negative subjects 20. In this study, only one out of 354 TST score-negative close contacts developed tuberculosis, resulting in an NPV for the TST of 99.7% (95% CI 98.5–100%) compared to 100% for the QFT-G-IT (95% CI 99.4–100%). Four studies investigating the probability of developing active disease in subjects with a positive IGRA result were included for analysis (table 2). Two studies were screening studies among HIV-positive subjects, while the other two consisted of large contact investigations among native and immigrant subjects in Germany and the Netherlands. Only one study 20 included children aged <16 yrs. The rate of progression to active disease among subjects having tested positive for LTBI, and having refused preventive treatment, ranged 2.3–3.3% for TST, 2.8–14.3% for QFT-G-IT and 3.3–10% for T-SPOT®.TB (table 2). In a study by Clark et al. 22, 201 HIV-infected patients diagnosed with LTBI were followed for a median period of 12 months. Two out of the 20 HIV-infected patients with positive T-SPOT®.TB results, and who did not receive preventive treatment, developed active tuberculosis, resulting in a PPV for progression of 10% (3 and 10 months after testing, no detail or comparative results with the TST were reported). In an extensive contact investigation study, Diel et al. 20 followed the outcome of 41 QFT-G-IT-positive close contacts, all of whom did not receive preventive therapy, for a period of ≤2 yrs. Four of the individuals were TST-negative and three were children <16 yrs of age. Within this period, six out of the 41 untreated, QFT-G-IT-positive subjects developed active tuberculosis (PPV for progression 14.6%), including one QFT-G-IT-positive, TST-negative contact. In comparison, of the 219 untreated TST-positive contacts followed, only five developed tuberculosis (PPV for progression 2.3%). The progression rate increased to five (5.6%) out of 90 when a 10 mm TST cut-off was applied. Aichelburg et al. 19 enrolled 830 HIV-infected individuals in an extensive LTBI screening study. Among the study group, 36 were QFT-G-IT-positive, subsequently diagnosed with LTBI and followed for a mean period of 19 months without receiving preventive treatment. An additional seven individuals also tested positive at the time of screening, but were then diagnosed with active tuberculosis and subsequently excluded from the follow-up. Of the 36 QFT-G-IT-positive individuals, three had developed active tuberculosis within the follow-up period, resulting in a PPV for progression of 8.3%. Comparison between TST and QFT-G-IT results with respect to progression of disease was not possible, due to the fact that TST was not administered in all individuals. In their study, Kik et al. 21 included 433 close immigrant, adult contacts in the Netherlands, none of whom was immunosuppressed. QFT-G-IT or T-SPOT®.TB was performed only in TST-positive patients or in persons with a known prior TST result ≥10 mm (n = 17). All TST-positive contacts were followed for ≤24 months. In total, 339 (78.3%) of the 433 contacts were TST-positive. IGRA was performed on 327 of the TST-positive contacts, of which 179 (54.4%) tested positive using the QFT-G-IT and 181 (60.5%) tested T-SPOT®.TB positive. Nine (2.6%) of the 339 contacts developed active tuberculosis; IGRA had been performed in eight of these contacts, of whom six had scored positive. The PPV value for developing active tuberculosis was 3.1% (nine out of 288; 95% CI 1.4–5.8%) for TST (cut-off ≥10 mm), 2.8% (five out of 178; 95% CI 0.9–6.4%) for QFT-G-IT and 3.3% (six out of 181; 95% CI 1.2–7.0%) for T-SPOT®.TB. 34 studies 27, 39, 45, 47–77 from a total of 18 different countries fulfilled the inclusion criteria for this section of the review. Four studies were from intermediate-burden countries (South Korea 55, Lithuania 59, Iran 63 and Turkey 72) and three studies were from high-burden countries (India 56, South Africa 61 and Vietnam 65). Seven studies were based solely on paediatric cohorts 39, 51, 54, 59, 73, 75 and three studies 47, 57, 61 included children in the study population. 17 of the 34 articles calculated the odd ratios, assessing the influence of different factors on test positivity in multivariate analyses. In nine of these, TST positivity was significantly associated with BCG vaccination as an independent predictor in multivariate analysis 47, 50, 55, 62, 67, 71, 72, 74, 77 with odd ratios ranging between 3.8 (95% CI 1.0–13.9) 50 and 24.7 (95% CI 11.7–52.5) 48 regardless of the epidemiological context. No correlation was found between IGRA positivity and BCG vaccination. In nine of the 10 studies comparing the odds for test positivity with M. tuberculosis exposure gradients, or using chest radiography lesions as a surrogate of prior exposure, the IGRAs associated better with exposure than the TST, irrespective of the setting’s disease burden. Furthermore, there was generally a poor agreement between IGRAs and TST results (for κ statistics, see table 3). In the past few years, a large number of studies have been published on the performance of IGRAs for the diagnosis of LTBI in different cohorts at risk for progression to active tuberculosis. We performed a systematic review and meta-analysis to assess the accuracy of commercially available IGRAs in terms of specificity, NPV and PPV as the main estimates. Despite the volume of publications on the subject, only a limited number of studies fulfilled the inclusion criteria for our systematic review and meta-analysis. This is due to the use of noncommercial IGRAs or methodological limits in the design of individual studies. Based on the results obtained from our analysis we identified that: 1) the IGRAs show a higher specificity compared with the TST; 2) the NPV in patients with active tuberculosis as a surrogate of LTBI is high (although with a high variability in values); 3) the ability of the IGRAs to predict that a test-negative individual will not develop disease is even higher; and 4) the predictive value for progression to active disease when testing positive is higher for the IGRAs compared with the TST. However, NPV and PPV remain to be established in the paediatric population and in immunocompromised individuals, e.g. patients with advanced HIV infection, transplant recipients or candidates for TNF antagonists therapies. The pooled specificity (99.4%, 95% CI 97.8–99.9%) when measured in low-risk population groups using the QFT-G-IT (the only IGRA for which results could be analysed in all included studies) was clearly higher than the pooled specificity for the TST (88.7%, 95% CI 84.6–92.0%). These results suggest that the IGRAs are more certain to correctly identify individuals not infected with M. tuberculosis as compared to the TST. However, the estimates have to be interpreted with caution due to the low number of included studies. An optimal LTBI diagnostic tool should be predictive of an individual’s risks for developing or not developing active disease when tested. When analysing the studies using cohorts of active tuberculosis cases as surrogates of LTBI, a high overall NPV value was measured (pooled NPV 94% for T-SPOT®.TB and 88% for QFT-G-IT). This would suggest that IGRAs, especially the T-SPOT®.TB, are effective at ruling out M. tuberculosis infection. However, caution must be exercised when interpreting these results, as there was a high variability between the studies (ranging 70–98% for the QFT-G-IT and 92–100% for the T-SPOT®.TB), probably due to the corresponding prevalence of active tuberculosis cases, thus limiting the utility of pooling data across studies. This would, therefore, refute the conclusion that the IGRAs are an effective rule-out test for LTBI. Conversely, longitudinal NPV studies on mostly immunocompetent adults in low-prevalence countries, who are at risk for LTBI, suggest that one can be reasonably confident that, when scoring negative with an IGRA, the likelihood of false negative results is low. High NPVs were found for both the QFT-G-IT and the T-SPOT®.TB (pooled NPV of 97.8% for T-SPOT®.TB and 99.8% for QFT-G-IT). This indicates that an individual testing negative will most likely not develop tuberculosis in the future. However, a limitation of this analysis was the low number of individuals included in the studies (n = 1,442), the short durations of follow-up and the fact that similar studies have not yet been performed in high-burden settings. The QFT-G-IT and the T-SPOT®.TB both showed a similar PPV for progression, with a slightly wider range in values as compared to the TST (2.8–14.3% for QFT-G-IT; 3.3–10% for T-SPOT®.TB and 2.3–3.3% for TST), suggesting that the IGRAs have a higher predictive value for progression to active disease as compared with the TST. If IGRA performance was not conditionally restricted to prior TST positivity (as was the case in one study), the progression rates were higher (8, 10 and 15%) than those reported for TST, with 2 yrs follow-up 19, 20, 22. In the study by Kik et al. 21, a lower PPV value for progression was measured (3%); however, the study was limited to assessing the IGRA among TST-positive individuals, thereby presenting a source of bias. Studies on predictive value of the IGRAs with regard to developing active tuberculosis upon testing positive are still very few, with only four studies having fulfilled our inclusion criteria, and they often vary substantially in design and rely on empirical observations of subjects refusing LTBI treatment. Additional, larger sized studies including new markers for LTBI are needed to evaluate the predictive values of IGRAs and other biomarkers in groups with the highest risk of progression to tuberculosis, especially in children and in immunocompromised hosts. The review of studies investigating the influence of BCG vaccination on TST positivity and the influence of exposures for LTBI clearly confirmed, despite the large heterogeneity in the design of the analysed studies, that, unlike the TST, the newest commercial IGRAs are not affected by prior BCG vaccination. They are subsequently more likely to be associated with exposure to tuberculosis cases compared to the TST. These results were not influenced by the epidemiological context where the studies were performed (high- versus low-incidence countries). The review only assessed TST results in the context of IGRA studies and, thus, the results on prior studies on the accuracy performing the TST alone could not be taken into consideration. Furthermore, we did not evaluate the ability of IGRAs to discriminate recent from remote LTBI and the phenomenon of conversion/reversion over time or after therapy. Although this would be a very important point in a public health programme, the data available today 78–82 are limited and mostly obtained with experimental techniques and in particular settings, making it difficult to interpret their potential clinical value. In conclusion, the present systematic review and meta-analysis of the accuracy of the IGRAs for LTBI diagnosis confirm the concept that the IGRAs are a valid alternative to the TST. The superior specificity and the good NPV make them the first choice, especially in BCG-vaccinated subjects. The current evidence is, however, still limited in determining whether the IGRAs have a stronger predictive value for developing active disease later in life, as compared to the TST. 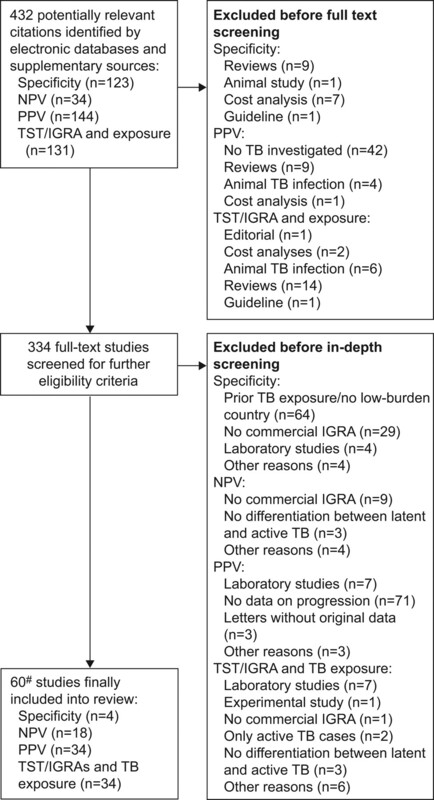 In the development of guidance on the use of IGRAs in tuberculosis screening programmes, it is vital that such evidence is considered when describing diagnostic algorithms for the diagnosis of LTBI. In this way, we can provide support to assure that only assays with proven accuracy are introduced into national screening programmes for further advancement towards the elimination of tuberculosis. The authors’ affiliations are as follows: R. Diel (Dept of Pneumology, Medical School Hanover, Hanover, Germany); D. Goletti (Dept of Epidemiology and Preclinical Research, National Institute for Infectious Diseases L. Spallanzani, Rome, Italy); G. Ferrara (Section of Respiratory Diseases, Dept of Internal Medicine, S Maria Hospital, University of Perugia, Terni, Italy); G. Bothamley (Homerton University Hospital, NHS Foundation Trust, London, UK); D. Cirillo (Emerging Bacterial Pathogens Unit, San Raffaele Scientific Institute, Milan, Italy); B. Kampmann (Academic Dept of Paediatrics, Imperial College, London); C. Lange (Division of Clinical Infectious Diseases, Research Center Borstel, Borstel, Germany); M. Losi (Dept of Oncology, Hematology and Respiratory diseases, University of Modena and Reggio Emilia, Modena, Italy); R. Markova (Immunology and Allergology, National Center of Infectious and Parasitic Diseases, Sofia, Bulgaria); G.B. Migliori (WHO Collaborating Centre for Tuberculosis and Lung Diseases, Tradate, Italy); A. Nienhaus (Institute for Health Service Research in Dermatology and Nursing, University Medical Center Hamburg-Eppendorf, Hamburg, Germany); M. Ruhwald (Clinical Research Centre, Hvidovre Hospital, Copenhagen University, Copenhagen, Denmark); D. Wagner (Division of Infectious Diseases and Centre of Chronic Immunodeficiency, University Medical Center, Freiburg, Germany); J.P. Zellweger (Dept of Ambulatory Care and Community Medicine, University of Lausanne, Lausanne, Switzerland; E. Huitric, A. Sandgren and D. Manissero (both European Centre for Disease Prevention and Control (ECDC), Stockholm, Sweden). The authors thank M. Sester (Institute of Transplantation and Infection Immunology, University of Saarland, Homburg, Germany) and C. Giehl (Head of Life Science Division, EURICE, Saarbrücken, Germany) for management and editorial support, and G. Sotgiu (Institute for Biostatistics and Epidemiology, University Sassari, Sassari, Italy) for statistical advice. The Tuberculosis Network European Trials Group (TBNET) is a Clinical Research Collaboration (CRC) of the European Respiratory Society (ERS).
. Framework Action Plan to Fight Tuberculosis in the European Union. www.ecdc.europa.eu/en/publications/Publications/0803_SPR_TB_Action_plan.pdf Date last accessed: July 7, 2010. Date last updated: 2008.
. QuantiFERON®-TB Gold. www.cellestis.com/IRM/content/aust/qtfproducts_tbgoldintube.html Date last accessed: October 29, 2010. Date last updated: 2009.
. T.SPOT®.TB. www.oxfordimmunotec.com/T-SPOT.TB_International Date last accessed: October 29, 2010. Date last updated: 2009.
. Systematic review: T-cell-based assays for the diagnosis of latent tuberculosis infection: an update. Ann Intern Med. 2008; 149: 177–184.
. Tuberculosis Clinical diagnosis and management of tuberculosis, and measures for its prevention and control. London, Royal College of Physicians, 2006.
. Guidelines for using the QuantiFERON-TB Gold test for detecting Mycobacterium tuberculosis infection, United States. MMWR Recomm Rep 2005; 54: 49–55.
. The risk of tuberculosis related to TNF antagonist therapies: a TBNET consensus statement. Eur Respir J 2010; 36: 1185–1206.
. Interferon-γ release assays for the diagnosis of active tuberculosis: sensible or silly? Eur Respir J 2009; 33: 1250–1253.
. Systematic review of interferon-γ release assays in tuberculosis: focus on likelihood ratios. Thorax 2010; 65: 271–276.
. Detection and prediction of active tuberculosis disease by a whole-blood interferon-γ release assay in HIV-1-infected individuals. Clin Infect Dis 2009; 48: 954–962.
. Predictive value of a whole blood IFN-γ assay for the development of active tuberculosis disease after recent infection with Mycobacterium tuberculosis. Am J Respir Crit Care Med 2008; 177: 1164–1170.
. Interferon-γ release assays improve the diagnosis of tuberculosis and nontuberculous mycobacterial disease in children in a country with a low incidence of tuberculosis. Clin Infect Dis 2007; 45: 322–328.
. Comparison of Mantoux and QuantiFERON TB Gold tests for diagnosis of latent tuberculosis infection in Army personnel. Clin Vaccine Immunol 2007; 14: 477–480.
. Use of whole-blood samples in in-house bulk and single-cell antigen-specific gamma interferon assays for surveillance of Mycobacterium tuberculosis infections. Clin Vaccine Immunol 2008; 15: 327–337.
. Evaluation of an interferon-γ release assay, T-SPOT.TB, in a population with a low prevalence of tuberculosis. Int J Tuberc Lung Dis 2009; 13: 1416–1421.
. Comparison of the sensitivity and specificity of two whole blood interferon-γ assays for M. tuberculosis infection. J Infect 2008; 56: 348–353.
. Comparison of performance in two diagnostic methods for tuberculosis infection. Med Microbiol Immunol 2009; 198: 33–37.
. Comparison of two commercial interferon-γ assays for diagnosing Mycobacterium tuberculosis infection. Eur Respir J 2006; 28: 24–30.
. Quantitative lung T cell responses aid the rapid diagnosis of pulmonary tuberculosis. Thorax 2009; 64: 847–853.
. Selected RD1 peptides for active tuberculosis diagnosis: comparison of a gamma interferon whole-blood enzyme-linked immunosorbent assay and an enzyme-linked immunospot assay. Clin Diagn Lab Immunol 2005; 12: 1311–1316.
. Rapid diagnosis of smear-negative tuberculosis by bronchoalveolar lavage enzyme-linked immunospot. Am J Respir Crit Care Med 2006; 174: 1048–1054.
. Usefulness of whole-blood interferon-γ assay and interferon-γ enzyme-linked immunospot assay in the diagnosis of active pulmonary tuberculosis. Chest 2007; 132: 959–965.
. Enzyme-linked immunospot assay for interferon-γ in the diagnosis of tuberculous pleurisy. Clin Microbiol Infect 2009; 15: 173–179.
. Usefulness of interferon-γ release assays in the diagnosis of tuberculosis infection in HIV-infected patients in Bulgaria. Biotechnol Biotechnol Eq 2009; 23: 1103–1108.
. Diagnosis of tuberculosis by an enzyme-linked immunospot assay for interferon-γ. Emerg Infect Dis 2007; 13: 553–558.
. Use of an interferon-γ based assay to assess bladder cancer patients treated with intravesical BCG and exposed to tuberculosis. Clin Biochem 2007; 40: 913–915.
. Contact tracing using a new T-cell-based test: better correlation with tuberculosis exposure than the tuberculin skin test. Int J Tuberc Lung Dis 2005; 9: 1242–1247.
. Screening for tuberculosis infection in spanish healthcare workers: comparison of the QuantiFERON-TB Gold in-tube test with the tuberculin skin test. Infect Control Hosp Epidemiol 2009; 30: 876–883.
. Interferon-γ release assay improves the diagnosis of tuberculosis in children. Pediatr Infect Dis J 2009; 28: 510–514.
. Use of an interferon-γ release assay to diagnose latent tuberculosis infection in foreign-born patients. Chest 2008; 133: 869–874.
. Evaluation of interferon-γ release assays in the diagnosis of recent tuberculosis infection in health care workers. PLoS One 2009; 4: e6686.
. The role of a whole blood interferon-γ assay for the detection of latent tuberculosis infection in Bacille Calmette–Guerin vaccinated children. Diagn Microbiol Infect Dis 2008; 62: 389–394.
. Validity of interferon-γ-release assays for the diagnosis of latent tuberculosis in haemodialysis patients. Clin Microbiol Infect 2010; 16: 960–965.
. Comparison of a whole blood interferon-γ assay with tuberculin skin testing for the detection of tuberculosis infection in hospitalized children in rural India. J Infect 2007; 54: 267–276.
. Comparison of two commercially available gamma interferon blood tests for immunodiagnosis of tuberculosis. Clin Vaccine Immunol 2008; 15: 168–171.
. Accuracy of an immune diagnostic assay based on RD1 selected epitopes for active tuberculosis in a clinical setting: a pilot study. Clin Microbiol Infect 2006; 12: 544–550.
. IFNγ and antibody responses among French nurses during a tuberculosis contact tracing investigation. Pathol Biol (Paris) 2009; 57: e49–e53.
. Highly discordant T cell responses in individuals with recent exposure to household tuberculosis. Thorax 2009; 64: 840–846.
. Contribution of a IFN-γ assay in contact tracing for tuberculosis in a low-incidence, high immigration area. Swiss Med Wkly 2008; 138: 585–593.
. Comparison of QuantiFERON TB-G-test to TST for detecting latent tuberculosis infection in a high-incidence area containing BCG-vaccinated population. J Eval Clin Pract 2009; 15: 148–151.
. Tuberculosis screening in patients with psoriasis before antitumour necrosis factor therapy: comparison of an interferon-γ release assay vs. tuberculin skin test. Brit J Dermatol 2009; 161: 797–800.
. Comparison of tuberculin skin test and a specific T-cell-based test, T-Spot.TB, for the diagnosis of latent tuberculosis infection. J Int Med Res 2007; 35: 696–703.
. Reproducibility of QuantiFERON-TB gold in-tube assay. Clin Vaccine Immunol 2008; 15: 425–432.
. Comparison of an ESAT-6/CFP-10 peptide-based enzyme-linked immunospot assay to a tuberculin skin test for screening of a population at moderate risk of contracting tuberculosis. Clin Vaccine Immunol 2007; 14: 714–719.
. Comparison of the QuantiFERON-TB Gold In-Tube test with the tuberculin skin test for detecting latent tuberculosis infection in hemodialysis patients. Transpl Infect Dis 2010; 12: 98–105.
. Comparison of positive tuberculin skin test with an interferon-γ-based assay in unexposed children. Jpn J Infect Dis 2008; 61: 192–195.
. Interferon-γ release assays versus tuberculin skin testing for detection of latent tuberculosis in chronic haemodialysis patients. Nephrol Dial Transplant 2009; 24: 1952–1956.
. Comparison of QuantiFERON-TB Gold In-Tube Test and tuberculin skin test for identification of latent Mycobacterium tuberculosis infection in healthcare staff and association between positive test results and known risk factors for infection. Infect Control Hosp Epidemiol 2009; 30: 215–221.
. Interferon-γ-release assays detect recent tuberculosis re-infection in elderly contacts. Int J Immunopathol Pharmacol 2009; 22: 669–677.
. Latent tuberculosis infection treatment and T-cell responses to Mycobacterium tuberculosis-specific antigens. Am J Respir Crit Care Med 2007; 175: 282–287.
. Within-subject variability and boosting of T-cell interferon-γ responses after tuberculin skin testing. Am J Respir Crit Care Med 2009; 180: 49–58.
. Potential role for IL-2 ELISpot in differentiating recent and remote infection in tuberculosis contact tracing. PloS ONE 2010; 5: e11670.